Great Preowned Condition. Mid Shoulder to Bottom Hem 28 in. Half Stripe. Size L but can fit size M.
Vintage Polo Sport Quarter Zip Large. Condition is Pre-owned. Shipped with USPS Priority Mail. Polo Sport Quarter Zip Front Pocket Men's Large. Condition is Pre-owned. Shipped with USPS Priority Mail. Vintage Men's POLO SPORT RALPH LAUREN Hooded Sweater Medium. Shipped with USPS Priority Mail. 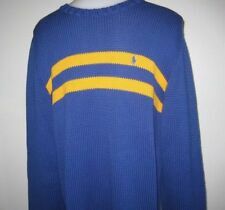 Vintage 90s Polo Sport Ralph Lauren Men’s Sweater Large XXL 2XL Crest T Shirt. Condition is Pre-owned. Shipped with USPS Priority Mail. Super cool 2 tone colorway. Vest has an amazing red, blue, white, and ivory colorway and striped design! A very stylish piece of clothing from the Polo line! A must for any Ralph Lauren fan and great for the fall and winter seasons! Materials: Wool silk blend 74/26. Shoulder to wrist 26. Shoulder to bottom 28. RL Polo Three Button Sport Collar, polo, rugby, nice color combo black, red, white. Condition is Pre-owned. Used twice, from a pets free smoke free home. Its more thicked material, nice and soft, no damage, holes etc. Material is: 85% cotton and 15% acrylic (just for decoration). Shipped with USPS. Be sure this will fit. Color is HEATHER GRAY w/Blue Trim w/POLO SPORT RL Flag Logos. Fleece is 100% Polyester. SWEATER OR. ARMPIT to end of the cuff is. Stretch Jersey Pullover. POLO SPORT. "ThermoVent" logo at the right hem. Color: Polo Black. Machine washable. Sleeve length is taken from the center back of the neck. Thick gauge and rare Nordic sweater from the Polo Sport label. Very warm. Wool, cashmere and alpaca blend. Hand knit. XL. Condition: 8/10. This shirt has been worn and washed. Refer to images for details. POLO SPORT BY RALPH LAUREN. POLO SPORT by Ralph Lauren is designed for Explorers, Travelers, & Adventurers and was established in 1967. Tan Fleece 1/4 Zip Pullover with PolarTec Material. PolarTec material is a Lightweight Polyester that rivals wool in warmth without the extra bulk and itch. Up for sale is a Extra Large White Fleece Polo Sport Sweater that is in good preowned condition. We appreciate you looking at our item for sale. Any used clothing can have natural wear. This can include fading and minor fraying. I will not cancel orders. Any custom shoes have been painted with angelus paint. The paint is not factory though so correct care must be taken. Rare Vintage Polo Sport Ralph Lauren Hoodie Hooded Sweater Sweatshirt Sz L. Condition is Pre-owned. Overall good condition for its shape. Minor tearing on the inside of the sweater in the zipper lining. Can’t see when worn and doesn’t affect zipper. Shipped with USPS Priority Mail. Measures 23 1/2” from pit to pit. Measures 27 1/2” from to of shoulder to bottom of sweater. 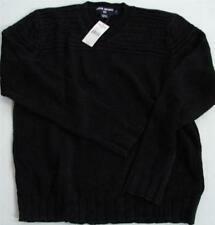 Polo Sport Light Sweater L. Condition is Pre-owned. Shipped with USPS Priority Mail. Vintage Mens Polo Sport Ralph Lauren Zip Up Sweater L-XL. It’s marked xl, but looks to be more of a large. Rubber Polo Sport logo on the front. Condition is Pre-owned. Shipped with USPS Priority Mail. 100% cotton pullover sweater. Classic look and feel. See photos and message with any questions. Small tearing by the zipper and small pinhole on back as show in pictures. Still has lots of life left in it! Colors- Navy Blue/Red. Size Large. Fit a little bigger. Gray with blue stripe. Mint condition. Thanks for supporting our small business! Shirt has a surface stain on me collar, we have not attempted to launder the sweater. Measurements: Size- Medium Chest- 22” armpit to armpit Length- 28” collar to the bottom of the shirt Sleeve- 25” shoulder to cuff Shop with confidence as all of our clothing comes exactly as described. Made out of 45% wool / 20% silk / 35% lambswool. Blue, tan and red in color. Cowl / turtleneck design. 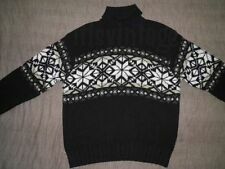 Features two reindeer and a snowflake on front and back. In great used condition with light wear from use. I noticed a small imperfection on the fleece on the back, it’s not a hole just one spot of imperfection. See pictures to ensure you would be happy to own this item. Good overall condition for its age- Minor piling- No holes. Material: 100% Wool. Sleeve length from shoulder seam: 24.5". Across waist: 19.75". Very good condition with no stains or holes. Exact measurements are in the photos. Condition: Pre owned fleece that has been worn and washed. Material: Polyester. Color: Green. Ski sportsman graphic motif on the front and back. Color: Dark Red. shoulders 21". 1 lb 15 oz . Pre-owned - in good used condition without stains, holes, or tears. sleeve (from top of shoulder to cuff).